Dandelions have a host of benefits and can help your body function properly all year round. This post is brought to you by Kiss Me Organics and their Dandelion Root Tea. All opinions expressed are my own. Time for holiday parties, potlucks, big family get-togethers and comforting meals. Personally, I love this time of year. Friends, family and food are the things that light me up and make me happy. But I also know that even with the right mindset about food, all of the deliciousness this time of year can take a toll. I'm sure you know what I am talking about. Even if you indulge mindfully this time of year you may end up feeling a little bit like a balloon by the time the clock strikes midnight on New Years Eve. Additionally, you may start to feel a bit sluggish and overall, not so hot. That's why it's as important a time as ever to develop a healthy habit or two in order to get you through this time without feeling miserable. One habit that I always recommend to Clients or those who are asking how they can feel better is to include some healthy herbal teas that can both provide a sense of calm but also aid with digestion and other ailments this time of year. That's where the dandelion plant comes in. Now you might be thinking, but wait - isn't dandelion a weed I am always trying to get rid of on my lawn. Well, in short yes. But that's only because few people recognize how powerful and beneficial the dandelion plant can be! In fact, the entire portion of the dandelion plant is edible and you will often find their green leaves for sale at your local greenmarket. For a more convenient way to consume dandelion, however, the root is often ground up and used as an herbal tea. Dandelion root provides a potent liver & kidney cleanse both of which are important to help aid digestion and reduce inflammation. Thanks to dandelion's ability to cleanse the liver, this also allows it to be a great diuretic and helps reduce bloating and shed water weight. Dandelion is also very high in Vitamins K (which helps with bone & heart health), Vitamin A (a powerful antioxidant) and Vitamin C (which helps boost the immune system). Now, I must be honest and say that while dandelion tea has a host of positive benefits, it can also have a very distinct, bold taste which is why it is often used as a coffee substitute when people are trying to give up their cup of joe. Personally, I don't mind it and did use it when I went caffeine free earlier this year. However, because of it's strong taste and association with coffee, I never considered it as a calming tea, let's get zen type of tea. But then I was sent Kiss Me Organics Dandelion Root Tea to try out. Immediately I was intrigued to read that along with the dandelion root, this tea blend contains hibiscus which is one of my favorite calming teas to drink. The blend also contains cinnamon which has a host of health benefits of its own. 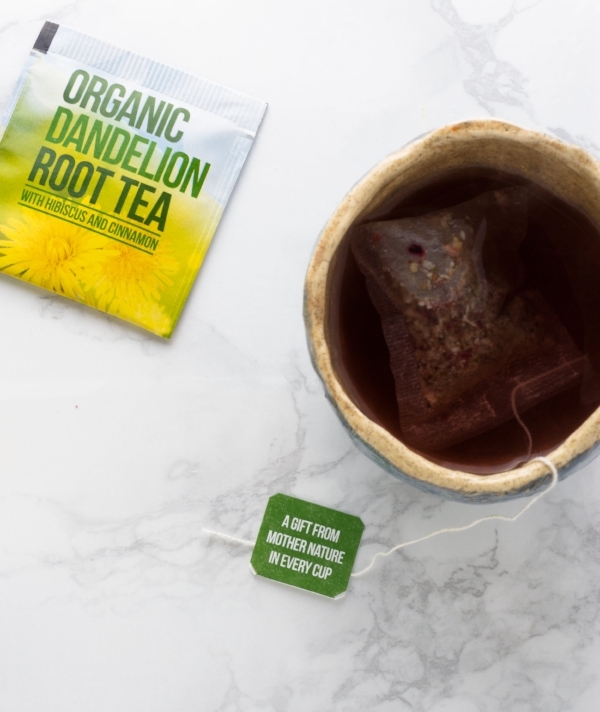 Floral yet bold, Dandelion Root Tea is a perfect addition to your healthy (holiday) routine. So one afternoon, I poured myself a cup as I settled down into my afternoon of work. I took a sip and although I was expecting a strong, bold flavor, I was pleasantly surprised by the subtleness of the dandelion flavor. Not to mention that the combination of hibiscus and cinnamon added a fruity and lighter flavor overall. A few more sips and I was hooked. It was enjoyable, refreshing and warming all at once. Plus, I knew that the raw dandelion root that Kiss Me Organics uses meant that all of the beneficial enzymes stayed intact so I could be sure every cup was delivering a potent dose of vitamins and nutrients. As I was sipping this tea, I recognized that I was holding what could be, for me, a super powerful healthy habit I could incorporate into my December routine. I tend to always get run down this time of year and being sure to sit and enjoy a cup everyday of Dandelion Root Tea could certainly help me slow down and make sure my systems are all functioning properly. So right there I committed to my routine and have been enjoying a cup a day ever since! I'd love to share with you a box of this tea so you can try it for yourself and discover the benefits of dandelion! That's why I am hosting a giveaway for one free box of Kiss Me Organics Dandelion Root Tea to one person this December. All you need to do is comment on this post and tell me what one healthy habit you'd like incorporate this holiday season. Giveaway will close on 12/8/17 at 11:59pm and winners will be selected at random on 12/9/2017.